While winter winds-up we’ll be indoors this Saturday in one of NYC somewhat lesser known magnificent museums. There’s loads to see. The Brooklyn Museum acquired its first works from sub-Saharan Africa in 1900, just three years after the Museum opened its doors. Today the collection numbers over five thousand items, making it the largest collection of African art in an American art museum. 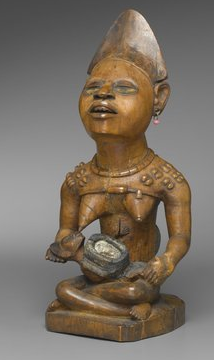 The collection of sub-Saharan African art is focused on the arts of West and Central Africa. And our sketching efforts will concentrate on that part of the museum, although everyone is of course free to explore. What: The Brooklyn Museum - paying special attention to their African Arts collection. Lunch: 12:30 in the Cafeteria, - buy or bring your own. Afternoon: 1:30 Back to sketching. Show and Tell: 3:00 - Meet in the lobby for a short walk to Tooker’s Alley 793 Washington Ave, where we will share drawings, good stories and and a snack or refreshments if you're so inclined. - Bring a stool if you have one. - Be aware that the museum wants pencil sketching only. This rule is unevenly enforced. 2-3 train to Eastern Parkway/Brooklyn Museum. You can transfer to 2/3 from 4/5 (at Nevins Street) and B, D, Q, N, R, and LIRR (at Atlantic Terminal-Barclays Center).